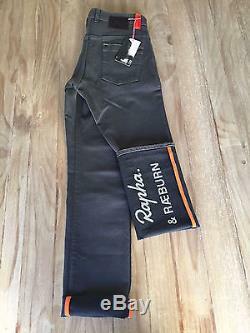 NEW Rapha and Raeburn Special Edition Cycling Jeans 500 Made for the WORLD!!! 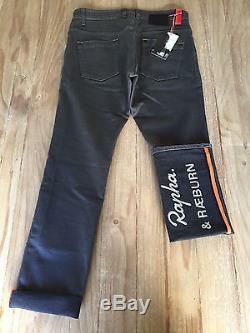 Mens 32 x 32 Gray w/ Orange details and reflective leg logo Milled in Italy made in England Per Rapha: Limited to 500 pieces. 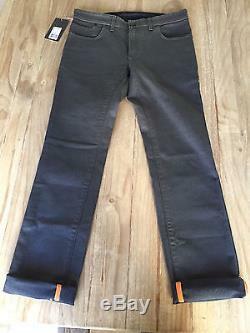 Cycling jeans made in collaboration with Christopher Raeburn milled in Italy and constructed in England. 32 inch inside leg only. 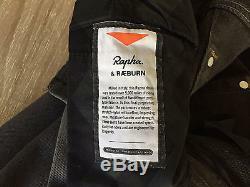 New version of Rapha Jeans made in England with Christopher Raeburn Proprietary, abrasion-resistant and flexible Rapha fabric made from nylon, cotton and Elastane-blend yarns. Also stain-resistant and fast drying. Woven specifically for Rapha in Italy, the denim was cut and stitched in England. 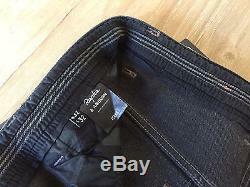 Standard straight-leg fit with high-backed waist and cut lower at the front. 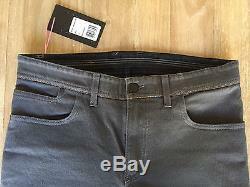 Offset inseams to prevent chafing, belt loops positioned for maximum comfort. The right-side rear pocket is reinforced for a compact D-lock. 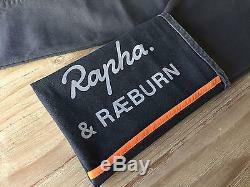 Soft gripper, similar to that used on Rapha jerseys, is used inside the waistband. The right leg displays a reflective Rapha & Raeburn logo print when turned-up, while the pocket bags feature a Christopher Raeburn Stock Print, an interpretation of a Swedish digital snow-camouflage pattern. Specially sourced orange reflective binding also features inside the lower legs. Key features: New darker weft for AW13 Abrasion resistant and flexible fabric Reflective print on inside right leg Woven in Italy Made in England FEATURES High-rise back Low cut waist Deep J-mouth pockets Reinforced pocket for D-Lock Offset seams Standard straight fit for on-bike comfort Fold up reflective print on right leg Reflective orange binding FABRIC Cotton 55% Nylon 44% Elastane 1%. 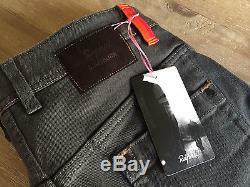 The item "NEW Rapha and Raeburn SPECIAL EDITION ONLY 500 MADE Cycling Denim Jeans 32 x 32" is in sale since Wednesday, June 21, 2017. 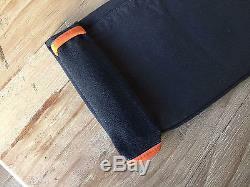 This item is in the category "Sporting Goods\Cycling\Cycling Clothing\Tights & Pants". The seller is "mariovelo" and is located in Boulder, Colorado. 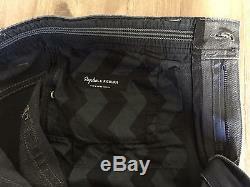 This item can be shipped to United States, Canada, United Kingdom, Denmark, Romania, Slovakia, Bulgaria, Czech republic, Finland, Hungary, Latvia, Lithuania, Malta, Estonia, Australia, Greece, Portugal, Cyprus, Slovenia, Japan, China, Sweden, South Korea, Indonesia, Taiwan, Thailand, Belgium, France, Hong Kong, Ireland, Netherlands, Poland, Spain, Italy, Germany, Austria, Russian federation, Israel, Mexico, New Zealand, Philippines, Singapore, Switzerland, Norway, Saudi arabia, Ukraine, United arab emirates, Qatar, Kuwait, Bahrain, Croatia, Malaysia, Brazil, Chile, Colombia, Costa rica, Panama, Trinidad and tobago, Guatemala, Honduras, Jamaica, Antigua and barbuda, Aruba, Belize, Dominica, Grenada, Saint kitts and nevis, Saint lucia, Montserrat, Turks and caicos islands, Barbados, Bangladesh, Bermuda, Brunei darussalam, Bolivia, Ecuador, Egypt, French guiana, Guernsey, Gibraltar, Guadeloupe, Iceland, Jersey, Jordan, Cambodia, Cayman islands, Liechtenstein, Sri lanka, Luxembourg, Monaco, Macao, Martinique, Maldives, Nicaragua, Oman, Peru, Pakistan, Paraguay, Reunion.